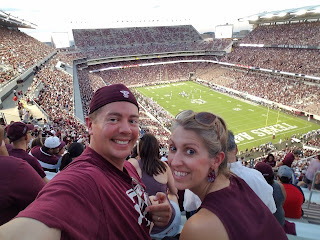 The first two experiences added to my Texas Bucket List were "watch a TAMU football game from the stands at Kyle Field" and "watch the Fighting' Texas Aggie Band perform live". It took seven-and-a-half years, but at the end of August we finally put checkmarks next to both. TAMU gave faculty members an opportunity to purchase affordable tickets for the TAMU vs. Northwestern State University game. We considered buying four tickets and taking the kids, but in the end decided we would take the kids another time and attend the game just the two of us. We cleared our evening, lined up a babysitter for Hallie/companion for Will, pulled out our maroon attire, and headed to Kyle Field. Despite the fact that the game kicked off at 7:30pm, it was - we were - HOT. We walked 3/4 of a mile from our car to the stadium, wandered around the grounds, watched the Corps march in, and then walked another (what seemed like) 3/4 of a mile UP to our seats, so by the time we finally sat down in row 31 of section 350, we were drenched. Turns out it was still 96 degrees with a "feels like" temperatures of 102 degrees at 8:30pm. The steamy weather didn't squelch our fun though. We ate hotdogs and drank soda, sang the National Anthem, took pictures of the flyover, and joined in the yells. I enjoyed watching Reveille lead the team onto the field before kickoff, and I loved the tradition of the Corps firing a canon every time the Aggies scored. The crowd volume, while not the loudest I've heard in a football stadium, impressed me, and the 12th Man student section and 12th Man on the field (a walk-on player wearing the number 12 jersey for the first play of the game) traditions tugged at my emotions. The football game itself was one of the most boring I've ever watched*, but the Aggies came out ahead and we had a great time cheering them on to victory. * The first half alone took more than two hours because there were SO MANY television timeouts, regular timeouts, reviews, and penalties. At one point Tom turned to me and acknowledged that he had really come to appreciate soccer for how it allows - even requires - players to just PLAY the game. I actually felt bad for the Aggie and NWS players because the television broadcasting "powers that be" and referees kept either team from ever finding any momentum on the field. The best part of the night, however, was - by far - watching the Fightin' Texas Aggie Band march at halftime. The TAMU Corps of Cadets is the largest military marching band in the United States, and while many people had told me there was nothing like watching this massive band perform live, I had my doubts; the Aggie Band only performs traditional marches, which I thought sounded somewhat anticlimactic coming in behind 80s medleys and animated marching formations. I could not have been more wrong in my assessment. According to an article in The Battalion student newspaper, "some of the Aggie band's maneuvers are so complex that drill-charter software says the drills are impossible because they require multiple people to be in the same place at the same time". I could see from the moment the Aggie Band took its first synchronized step that its maneuvers - obliques, flanks, countermarches, crisscrosses, continuous countermarks, and minstrel turns (confession: I had to look every single one of those up) - were some of the most difficult ever attempted by a marching band. The space between band members during some of these maneuvers is six inches or less, even for those who play large instruments, and they were never, and I mean NEVER, out of step or off their lines. I have never seen a band march with such incredible precision. The verdict? Watching Aggie football at Kyle Field, especially under the lights? Not a bad way to spend a Thursday evening. Watching the Fightin' Texas Aggie Band perform their halftime routine? The BEST way to spend a Thursday evening.